Rock & Metal 4 You: CD/DVD-Review: W.E.T. 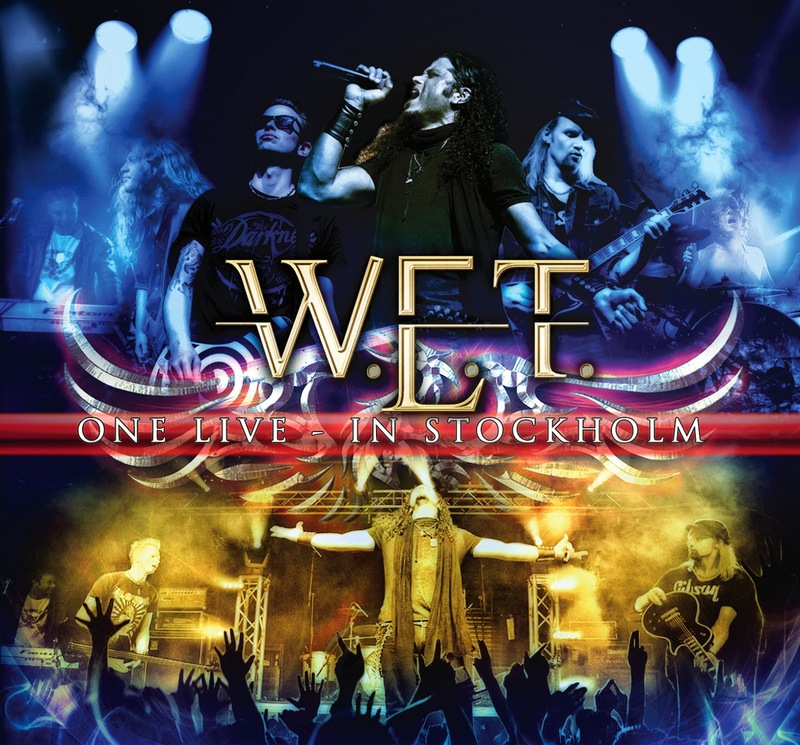 - "One Live - In Stockholm"
Last year the Melodic Rock Allstar-Project W.E.T. came along with one of the best records in this genre. 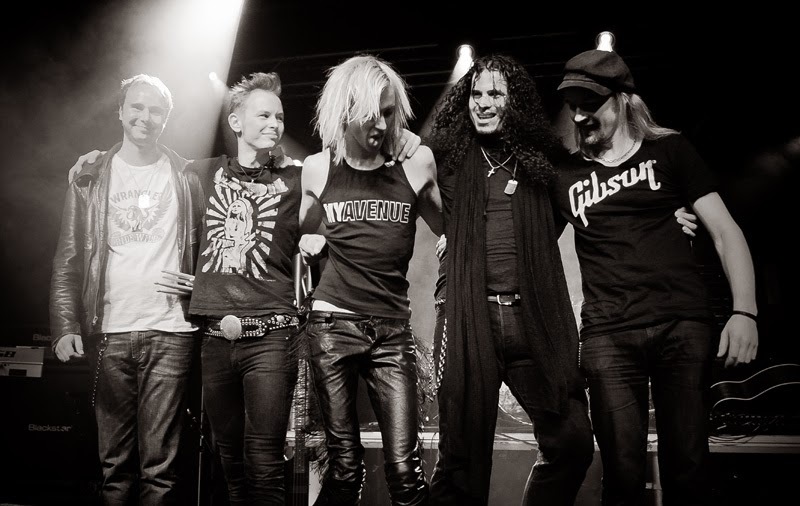 To celebrate the release of "Rise Up" the band played an exclusive show at the Debaser Club in Stockholm, Sweden on January 17th 2013. The whole show was captured for a live CD/DVD release, which hit the stores yesterday. Because it's all about the live performance, I will focus on the DVD in this review. For those of you, who aren't familiar with this band - W.E.T. features the following musicians: Robert Säll (the “W” from Work of Art), Erik Mårtensson (the “E” from Eclipse) and Jeff Scott Soto (the “T” from Talisman). So you see we deal with some of the best musicians in this genre and yes you can hear and see this professionalism in every note and every move on this DVD. W.E.T. present us a strong mix of songs from their debut album and the fantastic follow-up "Rise Up". These tracks are mixed up with some tunes from their main bands. The opener "Walk Away" will make you move immediately and is a pretty good start for a great show. I don't want to discuss several songs here, because nearly all tracks hit the spot and are simply very enjoyable Melodic Rock songs, which work on stage very well. Speaking about the musicians: Jeff Scott Soto sounds fantastic as always and the guitar work by Erik Martensson and Magnus Henriksson is also excellent, as well as the rhythm section. The whole band sound is just perfect ... maybe a bit too perfect for my ears, because the live-versions are very close to the studio versions and when I closed my eyes I thought I would listen to a regular album at times. This can be a really good thing if you think of the skills of the band, but it's also a bit disappointing if you expect a true live experience in your living room. And this is the main reason for me to watch a live DVD - it should feel like I'm part of the audience. Here I have to say I didn't had this feeling so often while watching this show. One major problem is that the audience is pretty lame. I mean, while the band plays the first songs you see people standing there and they do nothing - they don't really move, they don't partying or something like that. They are far away from a freaking out crowd. Between the songs you hear a bit applause and that's it. When the music starts you won't hear anything from the audience - pure silence ... and this is a bit sad, because the overall performance from the band is very powerful. Some people may now say this isn't important, but to me the energy between band and audience is very important, because this pulls me into a show when I watch it on my TV. Let's take a look at the technical side. As I said before, the sound is punchy and almost perfect. Also the picture quality is solid, no more, no less. I can't understand why Frontiers Records is still holding on to the DVD format. I mean, why they don't release it with a Blu-Ray? Most people have a HD TV at home nowadays and Blu-Rays aren't that expensive anymore. I don't have a problem when a DVD is used for some kind of bonus mterial, but on a live-record where the focus lies on the visual aspect and the sound I'd like to have the best quality that is possible and that means: a High Definition picture and HD sound. Look at the latest Europe Blu-Ray release. They showed how it should be done. It would be nice when Frontiers would release a DVD and a Blu-Ray version on future live-records, so the consumer can decide what he wants to buy. The CD-version features two bonus studio tracks from the "Rise Up" sessions. This is a nice gift for all die-hard fans. "Poison (Numbing The Pain)" is a typical rocker with a great hookline and "Bigger Than Both Of Us" is another nice power-ballad. So all in all "One Live - In Stockholm" is a really good package, which shows a band on the top of their game. The musicians are fantastic, as well as the songs. The release only suffers from the missing live-feeling at times and the DVD quality, which is simply not up to date. Wherever, every fan of this band can buy this one blindy and also people who weren't familiar with W.E.T. can take a look at this album. They will discover one of the best Melodic Rock bands we have right now. I was there, and the performances were that brilliant on teh night, they have not been sanitized in production.